The Destroyermen: RUSSELL Logs Another "First"
NAPLES, Italy – As part of regional missile defense cross-coordination between the U.S. Navy FIFTH and SIXTH Fleets, a long-scheduled Ballistic Missile Defense (BMD) exercise will start this weekend. USS Russell, operating in the eastern Mediterranean and USS Benfold operating in the northern Arabian Gulf will participate. Russell and Benfold, both Aegis-class destroyers, will be the first BMD-capable ships to operate simultaneously in the Mediterranean Sea and Arabian Gulf. During the exercise, the ships will work with one another in detecting, tracking, sharing information and engaging a simulated ballistic missile by sharing data via a number of paths. “This cooperation between neighboring fleets represents the latest in an ongoing series of defensive exercises intended to provide increased security. We will continue to periodically conduct these sorts of exercises to demonstrate our commitment to regional friends in the eastern Mediterranean and the Arabian Gulf,” said Vice Adm. Kevin J. Cosgriff, Commander U.S. FIFTH Fleet. Seven nations work with the U.S. Navy in various capacities to advance BMD capabilities around the world. The fundamental objective of the BMD program is to develop the capability to defend the United States, its friends and its forces against various types of ballistic missiles. 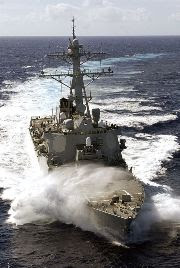 By late 2008, 18 Aegis ships are scheduled to be equipped with BMD. “We are beginning to see the fielding of this new capability. This exercise, which we began planning late last year, will demonstrate an important application of Aegis BMD in the Fleet,” said Winnefeld. BZ (to all of you) for your roles in this important issue of our national strategy. USS Russell continues to be on the cutting edge of technology. Good luck with the exercise and welcome back to cyberspace! It's been a while! You've condemned me to reading other Milblogs, namely, Army blogs. Ugh, shudder. Not really, but I miss hearing about the Navy from the Navy. BMD, sweet! Sounds interesting, to say the least. Do you just share info on a simulated missile and then simulate blowing it up? Sounds fun! :) Say hi to the crew for me; you, all other Navy personnel, and all other service members are in my prayers, always. Hope to see some more stuff up here soon!